By using this Web-site, you agree to the terms and conditions that are listed below and all the terms listed in the individual products description. An agreement between you (the purchaser) and this site owner is created by the fact that you have purchased and shipped any of the products listed on this site. This agreement encompasses the individual manufacturers’ restrictions and warranties, of which we have no control. Some of these manufacturer restrictions might entail their return policy, damage, and shipping. We have no control over the individual manufacturer’s policies, but will attempt to accurately convey said policies prior to you completing your purchase. RETURNS: When there is no return policy listed, it can be assumed that the product “CANNOT BE RETURNED”, with the exception being if it is damaged during shipping. There are times when these products can be returned, so contact us for clarification, BEFORE YOU PLACE YOUR ORDER. All costs of the return shipment are the customer’s responsibility and must arrange for the shipment to be sent directly back to the manufacturer, ONLY after authorization by email or in written form has been obtained. Most manufacturers require that the products being returned be sent back IN THEIR ORIGINAL CONDITION AND PACKAGING. Therefore it is advisable to SAVE ALL SHIPPING BOXES as well as PACKAGING. If returns are accepted by a specific manufacturer, there is usually a RESTOCKING FEE (from between 10% to 25%). Our manufacturers will provide free parts or replacement parts for damaged or missing products. Some also provide 1-800 numbers (included in the product documentation) so you can receive the missing parts as quickly as possible from the products manufacturer. DAMAGED ITEMS: If by some unforeseen circumstance items are damaged, or suspected to be damaged, it MUST be documented with the delivery company AT THE TIME OF THE DELIVERY. The driver must wait while you inspect the purchased items. If the driver refuses to wait while this takes place, you must make note of this on the waybill, WHEN YOU SIGN to accept the delivery. If there are signs of damage on the outside of the crates/boxes, you must also make note of this when you sign the delivery bill. Some of our manufacturers only make deliveries that are “curbside” and the driver will not carry the packages inside your home. Regardless of whether they deliver it to the curb and no further, or will take it into your home, if you notice any damage, note it on the delivery slip and insist that the items be opened and inspected. Once again, if the driver refuses, make sure that you note that fact on the delivery bill and get a copy for your records, or simply refuse delivery. In the event that there is damage, or suspected damage to any items due to shipping, you must notify this Web-site within three business days, either by phone, fax, or email. PRODUCT AND ASSEMBLY SAFETY: This Web-site and our parent company do not design, manufacture, or ship any of the products offered for sale on this site, and therefore we make no representation or guarantee as to the safety of these products. In the case where the product requires some assembly, the safety is solely the responsibility of the manufacturer, the shipper, or the purchaser. Any damage or suspected damage in shipping must be noted at the time that the shipment is received with the shipping company driver as mentioned above in DAMAGED ITEMS. You must also notify this Web-site within three days of the occurrence. If you feel that the damaged item might be a safety hazard, or cause harm to anyone using the item, we would strongly recommend that the product not be used. In the event that there is any product assembly required, it must be performed with the exact specifications from the Manufacturers’ written instructions and where possible, the manufacturers’ telephone technical assistance. Children’s furniture must be used with special care to safety issues as well. If you suspect any damage to the item/product, it must NOT BE USED WITHOUT FULLY READING THE MANUFACTURER’S INSTRUCTIONS AND WARNINGS, which come with the product upon delivery. If there are no explicit written instructions, DO NOT ATTEMPT TO ASSEMBLE OR USE THE PRODUCT/ITEM UNTIL YOU’VE RECEIVED THE CURRENT MANUFACTURER’S ASSEMBLY DOCUMENTS. We will help you obtain any missing documentation, warnings or assembly instructions. Prices Subject to Change, Site Inaccuracies, Errors, Discontinued items: We may have prices, descriptions and text that are not accurate because of typographical errors or changes not yet reflected in the product descriptions which might appear on our site. There may also be some products that are discontinued after an order has been processed. Advertised prices could also change without notice. This site shall not be responsible for honoring site price or product inaccuracies or product discontinuations. This site will notify the customer of any of these changes before the manufacture or shipment of an order, which will allow the customer to either cancel the order or change the order or payment amount based upon the se inaccuracies or price changes. When an item is discontinued, this site will notify the customer and arrange for a full refund. Limitation of Liability: Prices are subject to Change without notice, even after an order is placed and this web-site will not be liable for changes, other than to fully refund the purchases BEFORE DELIVERY. This web-site has no liability to any third-party claiming through you or you yourself for any damage suffered as a consequence of your displaying, copying or downloading this sites material. This web-site will not be liable to any third-party or you yourself for any consequential, punitive, extraordinary, indirect, or incidental damages, including the loss of any data, revenue, profits or any other economic advantage, even if it arises. Every Computer monitor has different quality and resolution and the colors & Textures might not be accurately portrayed. With all the possible problems regarding the visual interpretation of swatch samples on a computer screen, you open yourself up to a lot of disappointment and unhappiness. There is a good possibility that you’ll be disappointed if you only depend on what you see on your computer screen. Metals and fabric samples will be as accurate as you can get - but you have to request them BEFORE ordering. Or you could go to a local store where they have sample and swatch books. Another good thing about the convenience of the Internet is that the fabric makers will generously provide you with samples of their materials - and we can assist in this process. The completion of your order represents a waiver of claims that you might have as a result of dissatisfaction with the product textures, stains, colors and grains. Because your order/product has been customized to your exacting specifications, it cannot be returned or cancelled once it’s put into production by the manufacturer. Please read up on our Returns policy before ordering. General Use Restrictions: The contents of this site are the property of this web-site, its parent company, and the manufacturing partners, and are copyrighted. Any use, by anyone, without the express written consent could be a violation of communication statutes, privacy, and copyright laws. This Web-site allows a limited right for displaying and using the materials on the site for personal use. It is agreed that you will not use any of the material for any other purpose without first obtaining this web-site’s authorization in writing. You also agree not to publish, enhance/modify or reproduce any information displayed on this site and not post anything found on this site to newsgroups, bulletin boards or Blog sites. If you have breached any of the above mentioned items, the limited use license ceases and we will request that all the material, downloaded or printed, be destroyed. In the event that this site has links to other web-sites, we can not be held responsible for the content or claims of such external web-sites. We would only provide links to these external sites as a convenience to our customers. You agree that the quality of materials and third-party content displayed on this site can be affected by the inaccuracies listed above in “Site Inaccuracies”. You also agree that this web-site has no way of verifying third-party content, claims or material. This web-site has no control over third-party content, claims, material accuracy or timeliness. We can not be responsible for third-party omissions of content, claims and/or material. Local Laws: This web-site is owned and operated from its head office within the United States of America. We do not imply that any materials shown on this web-site will be appropriate or available for international use. The Local Law compliance is your responsibility, which includes the Import/Export laws of countries governing third party material and content, while you’re using this site. Violation of Terms of This Site. If the terms of this Web-site are violated, service can be terminated immediately, without further notice. It is agreed that the prices and products on this site can be modified or improved at any time, without notice, by this Web-site and its licensors. This Web-site can revise the terms and conditions of this site at any time by simply updating this page. The revised terms of this site are accepted by you, if you continue using the site after any such modifications. Florida and U.S. Law governs any actions related to the terms on this page. You agree to the Broward County, FL court’s jurisdiction for resolution of disputes that are related to using this Web-site and the Terms referenced on this Web-site. This Web-site does not waive the right to enforce the terms of this site, if any provisions in these terms and conditions are not enforced. The agreement between this Web-site and you as the customer is comprised of the terms and conditions, and supersedes any prior agreements or discussions between this web-site and you, regarding this subject matter. By using this site, you are subject to additional disclaimers and caveats that might appear throughout the various pages of this web-site. Certain links are provided that may lead to Web-sites maintained by third parties over whom we have no control. You agree that you shall not bring a suit or claim against www.braniffbarstools.com or any of our affiliates arising from or based on your purchase or use of products or services through those other sites. Links do not imply that www.braniffbarstools.com or any of our affiliates sponsors, endorses, is affiliated or associated with, or is legally authorized to use any trademark, trade name, logo, or copyright symbol displayed in or accessible through the links, or that any linked site is authorized to use any trademark, trade name, logo, or copyright symbol of www.braniffbarstools.com or any of our affiliates. 1. Sales Tax: Is collected only on orders delivered to the state of Florida. 2. Payment: Once your payment is made, your order is then processed, produced, and shipped. You can order and pay by credit card online or by phone, fax, email, or regular US mail. You can also send us a check or wire funds directly (contact us for details). 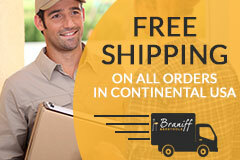 Any shipping charges are also collected in advance based upon our shipping calculator estimate. 3. Cancellations: You can only cancel an order before it goes into production with a $25 Cancellation fee. If you wish to cancel a custom order that’s already in production, you might find that the manufacturer may refuse to cancel. Or if it’s already shipped, they will require a large restocking fee, even before a delivery is made. All of your prepaid shipping fees are, of course, refunded in the event of cancellation before shipment is made. 4. Colors and Textures: Please see our Color and Texture Disclaimer mentioned above. The completion of an order constitutes a waiver of any claim due to your dissatisfaction with the product colors, textures, stains and/or wood grains. We encourage you to review samples of actual fabrics or finishes before you place an order. If you cannot review samples in advance and you’re unsure of colors and/or textures, we would advise you to make an attempt to acquire and examine the fabric or vinyl swatches at a retail store before ordering anything online, either through this web-site or any other web-site. You’re only setting yourself up for possible dissatisfaction. Your satisfaction is our goal. 5. Seat and Table Heights: Some heights may vary as much as 1 or 2 inches from the product description, depending upon the cushion, wood, metal etc. Even though we will attempt to provide you with guidance in making seat and/or table height determinations, it is entirely your responsibility for the accurate measurements of your specific seat height requirements. 6. Return Policies: The manufacturers of the various products determine and set their own individual return policy. Each manufacturer has specific return policy limitations. Please contact this web-site via email or phone BEFORE YOU ORDER. It is advised that you assume that the product can not be returned unless it is damaged in shipment, or defective in some way. When a manufacturer does allow returns without damage to the product, you are responsible for the cost of return shipment back to the manufacturer plus the cost of any manufacturer restocking fees imposed, between 10% and 30%. 7. Damage/Potential Damage: When you receive your delivery, whether by UPS, FedEx or Common Carrier (other truck), it is your responsibility to IMMEDIATELY determine whether the box or product inside is damaged. When you sign for the package, without making a note in writing with the delivery service, you waive ALL rights that you, braniffbarstools.com AND the manufacturer have to claim freight damage. Most of the time the box might appear damaged on the outside, but the product is safe and sound on the inside. The Manufacturers package their products extremely carefully so they can withstand the cross-country journey to your home or business. If you see some type of damage on the box, but cannot open it, you must note your concerns in writing with the delivery person when you sign for the delivery. Open the box immediately and carefully inspect the contents for any damage. If you find damage to the product, notify braniffbarstools.com IMMEDIATELY, by email and follow up with a phone call. You have between 2 and 5 business days to report any damage and start the process of making a claim. 8. Inside Delivery or LiftGate Fees: In some cases, your order is shipped via common carrier (truck) delivery to your residential location. Occasionally, you might require assistance with an "inside delivery." We will contact you before the order is processed by the manufacturer if any such LiftGate or Inside Delivery charges/fees will be incurred.